Disclaimer: this is not an original Food Wine & DIY recipe. These were made from a recipe my mom and sister raved about from Mess for Less that I followed pretty much to the tee. Please be sure to check out her site because she is literally a GENIUS for turning yogurt into bagels! There’s 4 items you’ll need total, but you likely have most or all of them home already, plus any toppings. These measurements yield 4 bagels. Simply adjust up or down (jk no one makes less bagels) for more bagels. 1. Add 1 1/2 tsp of baking powder, 1/2 tsp of salt and 1 cup of flour together in a mixing bowl and mix together. This creates self-rising flour so your bagels are nice and fluffy. 2. Add in 1 cup of Greek Yogurt to the bowl with the newly mixed self-rising flour and mix it all together with a spoon or your hands (it was slightly easier with my hands, but be sure to flour your hands before diving in to avoid too much sticking). Tip: for my baking newbies, a floured surface will help keep dough from sticking to literally everything. Same concept in the previous step with rubbing some flour on your hands before mixing/kneading. Note the cutting board in the picture below for a visual. 4. Break the dough into 4 equal parts and roll each into a solid ball. 5. Roll each ball out into a line, about 7 inches or longer, depending what you want your final bagel shape to look like, and mend the ends together to form a complete circle shape. 6. Once rolled into bagel form, I sprayed the top with cooking spray and added the Trader Joe’s Everything Bagel Seasoning. Tip: I added the seasoning to the bagel over a small bowl. I found the seasoning didn’t stick all that easily so I scooped up the excess and added back to the bagel. An alternative might be to lay out some seasoning on a sheet and press the bagel into it. 7. Bake at 350 degrees for 23 minutes. Remove, then set the oven to 450 degrees, then bake for another 2 minutes. This browns the outside nicely. I kept mine on the top rack for the last 2 minutes to brown the top but avoid burning the bottom. 8. I laid mine on a cooling rack to cool. You could also move to a plate or even pick the tinfoil up and place the whole setup on the counter. I just wouldn’t leave them on the baking tray if you’re afraid the bottom may keep browning. Before toppings, your bagel comes out to about 145 calories each, which is just unheard of! If you add the TJ’s Everything Bagel seasoning, and I highly recommend you do, it’s still only 150 calories per bagel (it’s TOTALLY worth it the extra 5 calories #treatyoself). These guys as-is are only 3 points on the Weight Watchers Freestyle program, which my mom and sister are all about thanks to my upcoming wedding (sorry not sorry guys 🙂 ) and they were so thrilled to find something so delicious. Shouts out to Mess for Less again on an amazing recipe that I plan to sub in for dough all over the place! Some other ideas for toppings that I am already thinking about include jalapenos, cheese and maybe some fruit ones for Kevin. 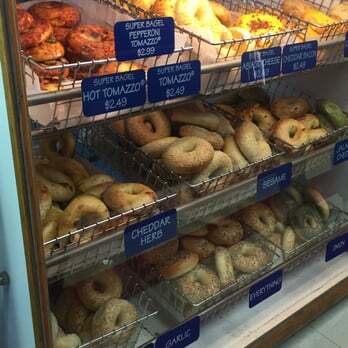 I’m also hard pressed to try and make a Tomazzo Bagel, a favorite of mine from Great American Bagel. I literally could not believe what I was eating when I tried them for the first time. They taste just like store-bought bagels! If you give them a try let me know what you think, because I think I’ll be making them all. the. time. I’d mentioned that the seasoning didn’t stick as great as I’d thought, so the second time I made them I put the seasoning in a small, flat dish and pressed the bagel into it. See how much fuller the coverage is? I’m hoping this helps the seeds stay on better, but I will report back once I actually eat the second batch to confirm!